The kitchen is complete with unique architecture and an open spacious feel. The deck offers a fireplace and BBQ area. An umbrella covered table on the large deck enjoys filtered views of the water and distant islands. Mesmerizing island and channel views abound from the deck. Often you'll see a pair of eagles in these trees. Hot tub is accessed from the lower level. The dramatic entry is surrounded by columns of stone. 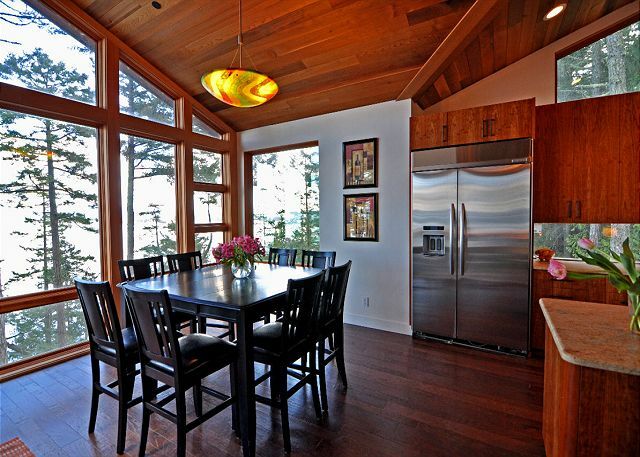 Gleaming hardwood floors and vaulted ceilings offer a true NW environment. This living room is a warm blend of drama and comfort. This cozy breakfast/game nook has dramatic views and seats eight. The formal dining room looks into the forest. One of the lower guest rooms with a queen bed and patio. 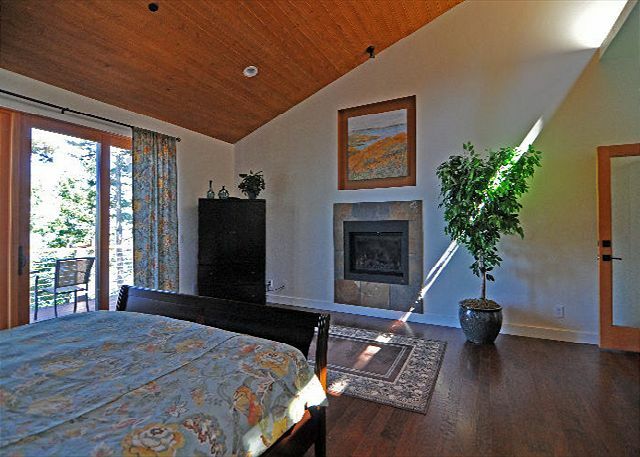 The master bedroom is on the main level and features a fireplace and private deck. A guest bedroom on the lower level. This wet bar with a microwave is downstairs; conveniently located for use by guests. Two day beds are located in the fourth bedroom. The media room has a large screen tv and all the gadgets! Lovely en-suite bathroom in a lower guest bedroom. 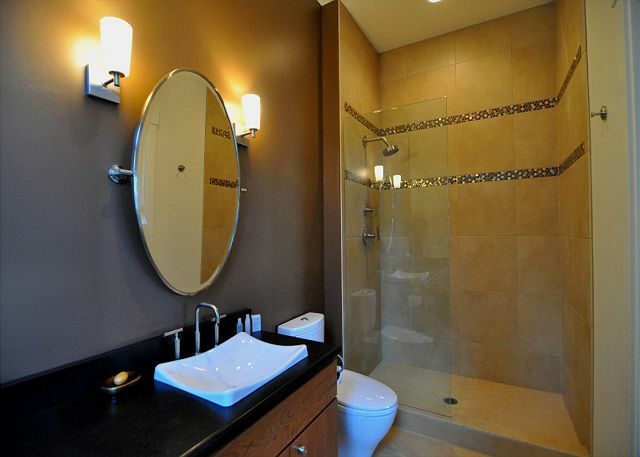 On the lower level, this bath is shared by bedrooms two and three. There is also a sauna. 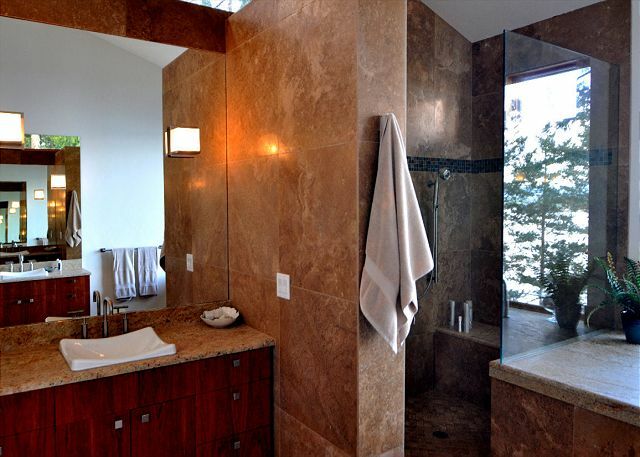 The master bath features dual vanities, slab granite surfaces, and a spectacular view from the tub! There's a propane fireplace in the master bedroom. A lower level guest room. In the media room you can settle in for a movie. 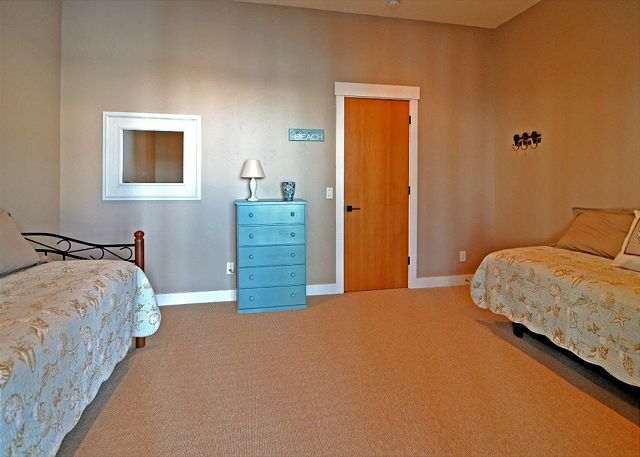 Note that the Exercise Studio is used as a fourth bedroom in Eagle Stone. 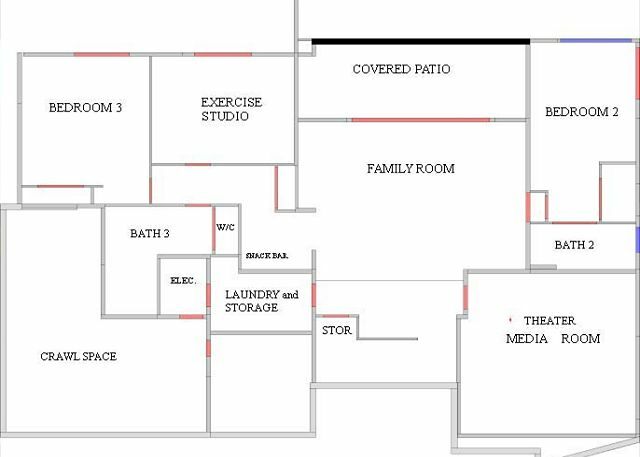 Approximate layout of main floor. 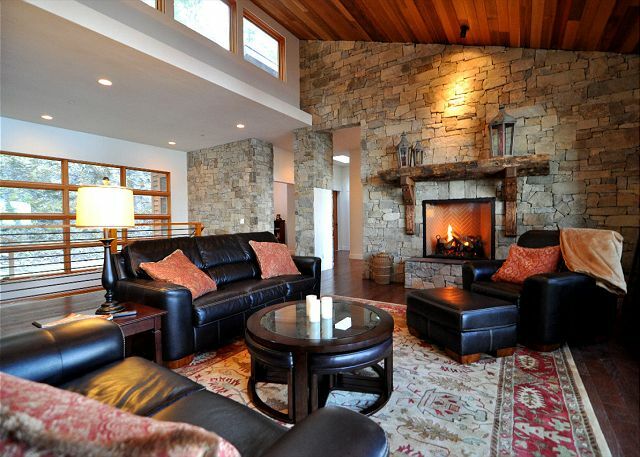 Eagle Stone is a spectacular vacation rental home on the San Juan Island waterfront. Everything about this Northwest contemporary home is dramatic, from the architectural use of wood and stone to big views over deep water San Juan Channel and the neighboring San Juan Islands. The house is set into a rugged hillside at the end of a private road, and blends beautifully into a natural environment that is shared with deer and a pair of resident eagles. The gourmet kitchen is equipped with high-end stainless appliances, a double oven, and a bar fridge and sink. Water and island views are enjoyed from a breakfast table at the end of the kitchen and allows for a separate dining experience. In addition to the kitchen, the main level contains a formal dining room, large great room with rock-faced fireplace, laundry room, and half bath. A gorgeous master suite can also be found including a fireplace, private deck, walk-in closet, a spacious bath with walk in shower, and a soaking tub overlooking the water. The living room opens to a beautiful deck with built-in BBQ and a wood burning fireplace. 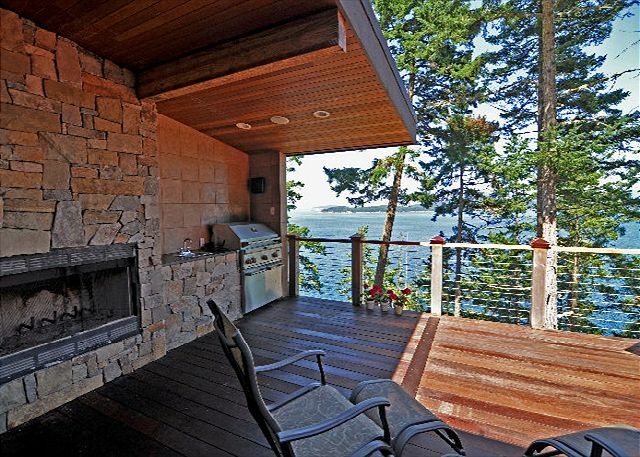 Vacation rentals in the San Juan Islands just don't get any better. On the lower level is another great room with a pool table, a massive media room with large screen TV, a sectional sleeper sofa, a second laundry room, and a wet bar. In addition, three guest rooms are located on the lower level, each with a sliding door to the outside and water views across the islands. 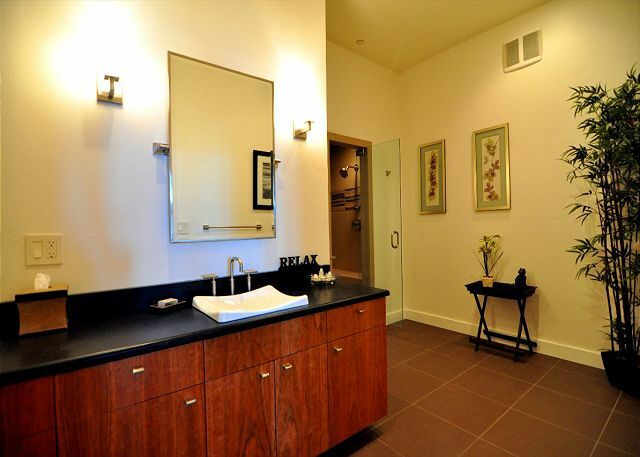 One bedroom with a queen size bed has its own private bath and enjoys direct access to the hot tub outside. The third and fourth bedrooms are in the opposite wing downstairs, one with 2 twin beds and the other with a queen bed. These two bedrooms share a large tiled bath with a relaxing sauna in the shower. All of the kitchen and bathing surfaces are finished in granite and tile. 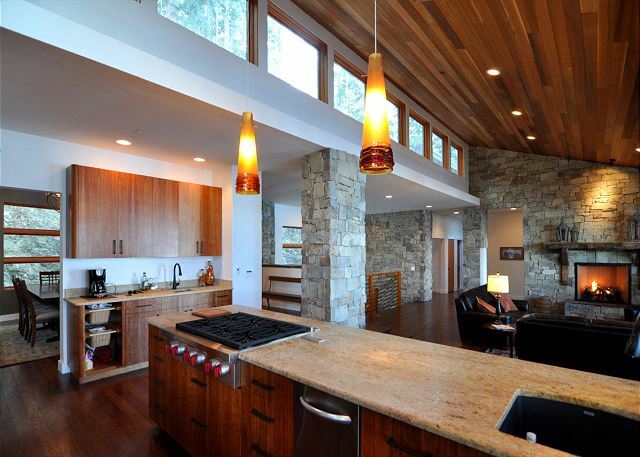 The ceilings are towering and massive, lined in the warmth of natural woods. There is also an open room upstairs welcoming you to a game of chess. Plenty of room for aerobeds, etc. downstairs if additional guests need accommodation (BYO.) Do note that 10+ guests are accepted only with the owner's specific agreement and a fee of $50 per night per additional guest. Located on the northeast side of San Juan Island, Eaglestone is sited along a rocky bank over deep water shoreline and accessed by a steep driveway. Please call the office prior to bookings about any concerns in this regard. This home is not appropriate for unsupervised children or active dogs. Rooms Sleeps 12, other beds are 1 rollaway bed and 1 air mattress. Your home was beautiful and relaxing. Everything one would ask for in a vacation rental. Absolutely gorgeous location. So peaceful and serene. 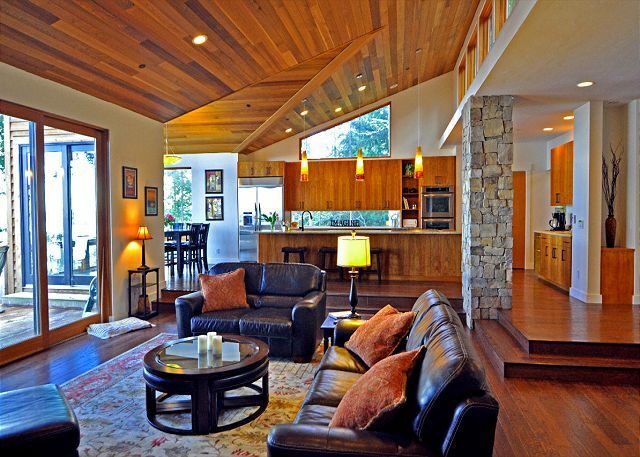 Phenomenal Property on San Juan Island! Couldn't imagine a better place to spend Labor Day, or any family vacation! This is an absolutely beautiful property with every amenity imaginable (e,g, a steam shower, hot tub, amazing master suite, three fireplaces, a cinema, and a kitchen fit for feasts), not to mention space to spare for a large group. Well worth the investment for your time on the island! Great location half way between Friday Harbor and Roche Harbor, and one road down from the best restaurant on the island, Duck Soup. Worth every penny v. hotels on the island given the number of bedrooms and features. We had eleven people and a dog and ranged in age from 4 to 75. This home was stunning and had plenty of room for all of us! The driveway is LONG (3/4 of a mile) and VERY steep at the end, but we so enjoyed the peace and quite that distance provided us. Perfectly situated midway between Friday and Roche Harbors with positively breath taking views. We wanted for nothing as the home was so well appointed. A lovely and unexpected surprise was dual laundry rooms - one on each floor! We hated to leave and are already planning a trip back! A quiet, peaceful location with eagles perched nearby. Eagle Stone accommodated all eleven of very comfortably. We all enjoyed cooking in the amazing kitchen, the steam shower, the pool table, hot tub and the beautiful views from the large deck! We had a great time on San Juan Island. 12 of our family met at the Ferry in Anacortes and for the next 7 days we had a great time biking, whale watching, zip lining and have a lot of fun around the house. We ate all our meals at the house and enjoyed cooking together and even cleaning up together. The bedrooms were great except for the queen sized hide-a-bed in the media room which the couple who drew the last straw even up sleeping on the floor with a blow-up mattress we luckily brought with us. We were able to gather our entire clan, all of our kids and grand kids (16 in all!! ), together for the most amazing vacation in Friday Harbor! We rented 2 houses and used the beautiful Eagle Stone for our main gathering hub. Wow, what a perfect vacation house! Beautiful views, private secluded location, professional kitchen, great beds and bathrooms, space to be alone if necessary, I could go on and on. We cannot wait to come back to the island and will make Eagle Stone our home away from home. First of all, this place is spectacular. The architecture, floor plan and view will knock your socks off. Only downsides were that one of the toilets didn't work and had a sign that said it would be fixed soon, and the hot tub was green when we showed up. It took a few days to get a handyman out to fix the toilet (he said it's always broken) and my mom got him to look at the hot tub. He said it's supposed to be maintained regularly but didn't looked like it had been serviced in a while. He adjusted the water quality and it cleared up after a day. Downside is hat the kids got in it before he worked on it and a few days later they all came down with impetigo. That's just gross and shouldn't happen. Management should take better care of this place for renters. If you are considering renting from this company be sure to ask a lot of questions to make sure everything is being maintained. It was wonderful home and we were never in need of anything for our family of 11 plus our dog. there were spectacular views , great kitchen for cooking and enjoying our time together , and much more. We loved our stay here and San Juan island was just magical like our dream. I have to say that using San Juan Vacation Ventures has been the best company that I ever have used for renting homes for vacation. They kept in constant contact with me, their phone app was outrageously easy and helpful and they helped us with minor questions and advice. Jancy is the bomb! Thank you so much Jancy! As far as the house goes.... it is centrally located on island. It is quiet and isolated. The deck is SPECIAL, we spent almost all of our time on vacation at the house and on the deck. The grill added to the ambience of the deck. Coffee, happy hour and late night visiting with friends happened on the deck. You can see other island, Mt. Baker in all its glory and the waterways and boats that are so entrancing. We had pool tournaments late at night in the pool room and each couple had to make dinner one night. The kitchen was a dream and so easy to be creative in. Every nook and cranny of the house was a dream. It fit all 3 couples well. I took advantage of the hot tub more than anyone and it was always hot and always inviting.... looking out over the water and isolated away from the rest of the house. We did not watch movies in the theater room, we just did not have time. Not sure how to work everything, so we did not touch it. The photos are accurate in the listing of this house. Actually, it is probably prettier than the photos. We would stay here again in a New York minute. Thank you for renting this house.... it will go down in our books as one of our favorite places. Once again we had a wonderful stay at Eagle Stone. The view from the deck is magnificent and the home is comfortable and welcoming. Lots of space for a large group. The kitchen is well equipped and easy to cook in. The curtains in the master bedroom do not cover the windows and with the sun coming up around 4:30 it gets very bright and difficult to sleep. Pillows on all the beds need to be replaced, they are flat and have been used too often. Finally, there was a bad smell in the media room, which I told the rental agent about. She was very responsive and would look into the issue. Our stay at Eagle Stone was fantastic - the house was roomy and well appointed with a wonderful view. The resident bald eagle made an appearance in a tree on the waterfront twice each day and posed for long periods of time. The house was clean and neat with room for everyone (8 adults and two children), and lots of windows made the place seem even bigger than it was. The only minor complaint was the request from property management that the water use be managed (stagger showers, etc.) to avoid overloading the septic system - however, this was not much of an issue and things went OK with a bit of planning. We would come back to this house again on our next visit to the islands. This home is absolutely breathtaking. If you are looking for a place to unwind from your day to day, this is it. We fit 8 people very comfortably and the house has all the kitchen and dining items you could ever need. The vacation rental contact was easy to work with and very friendly. House was great but dirty. House was very cool but not clean, especially the kitchen and outdoor kitchen. Great experience. Great location, and great place to stay. A couple small items here and there that didn't work like they should have but not a huge deal. Lots of room and space. Would definitely do it again. No surprises at this wonderful home, except good ones! We were a group of 9 school friends holding our annual gathering on San Juan Island. We do this every year and have never had a home as perfect as this was for us, and that includes my own 6200 sq ft VRBO home in California! The layout is perfect for larger groups with multiple spacious sitting areas, a wonderful kitchen that easily accommodates group cooking, and more than one dining area. The views are incomparable, great hot tub, nice hike to the main road and back with some good hills, and very comfy beds. Bathrooms beautiful and quite large, with a steam shower in one. The only tiny issue was not quite enough shampoo/soaps. I would highly recommend this house to families/groups of friends, and would absolutely rent it next time we're on the island. We rented this house for my mother's 80th birthday trip. What a spectacular home and location. The construction and layout was fantastic and the views wonderful. Every morning we had coffee on the deck and watched the parade of boats go buy, including the ferry. The gourmet galley style kitchen was perfect for preparing meals for a larger group. The bedrooms were very comfortable and accommodated us very well. We had 12 people at the house from 18 years to 80 and we all felt comfortable and could have our privacy if we wanted. This location is about half way between Roche Harbor and Friday Harbor so very convenient for getting around the island. 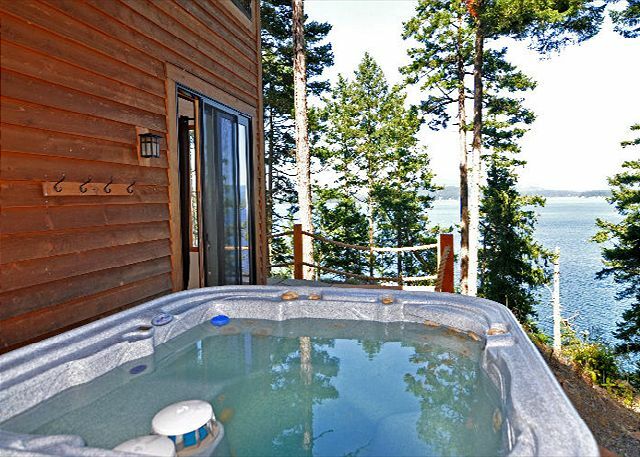 Definitely a must stay location for privacy and a taste of the beautiful views available in the San Juans. I highly recommend this property as well as the experience with the property management company. Everything was very professional and they provided all the information we needed to have a comfortable and stress free vacation. This home exceeded all our expectations. With it's stunning views and open spaces it was the ideal home for our family. My only criticism is that the broken garbage compactor should either be repaired or removed. Family with 4 generations and everyone had something to do. From the deck with fireplace and amazing view for viewing eagles, orcas and passing boats, to the hot tub, to the game room and media room, no one was ever bored. Great open design for lots of visting opportunity but large enough to find your own quiet area. Put this on an island with so many options for hiking, bicycling, shopping, exploring, kyaking, and boating, you have a winning combo for a great family getaway. Best family vacay ever! Well maintained with exception of the down-draft fan didn't work on the cooktop, but otherwise, an exceptionally well stocked kitchen and home. Great directions and rental experience. Everyone wants to return for our next gathering. Overall....very nice place to spend a 4-day weekend. The photos do not do justice to this gorgeous home. Spacious with views that are spectacular. The hot tub is fantastic. 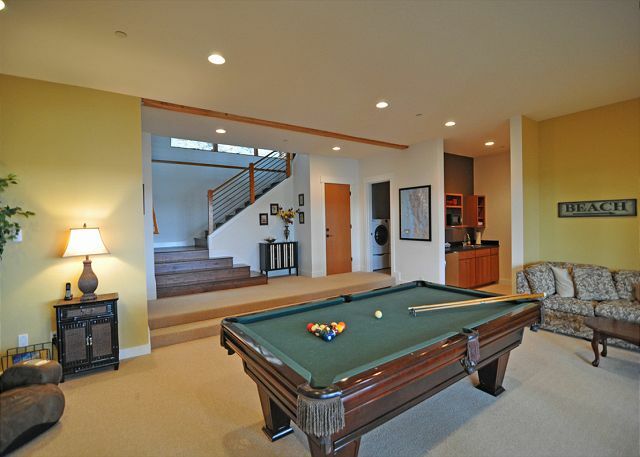 Our family loved the pool table and the media room. This is an absolutely amazing spot for a real vacation. Four family vacation for a week in August. Guests ranged in age from 8 to 66. Great house and views from the deck. Saw bald eagle and whale right from the deck. Short drive to Friday Harbor and Roche Harbor. Whale watching, kayaking, shopping, sightseeing and relaxing were enjoyed by all. The house was wonderful. Loved the location, views and comfort, especially the living room and the three sided views from the less formal eating area. Especially pleased with cleanliness! We enjoyed restaurants nearby (Duck Soup) and Roche Harbor, but it was hard to leave the view at home! We zip lined, hiked, golfed and kayaked but were always looking forward to getting back to the deck and reading or playing family games. We had a lovely stay at the property. Unfortunately, the cleaning lady who arrived the next morning was both rude and early. We were packing up our bikes and she arrived at 9:45 and barged into the house. Making comments such as "the sooner you are out of here the sooner I am finished.... I found this to be incredible rude and disruptive to our group. She also told us how "terrible" the winery was, which it is in fact the opposite. It was a very lovely experience at the winery and they have some delicious wines! It was just Fantastic, from the moment we pulled into the driveway, till the time we left - we were in awe of the place! Great views, great setting ...enjoyed the scenery with the fireplace to keep us warm! The Eagle Stone property was excellent, even better than advertised. We loved the house with the wonderful view from the large deck. Ten of us were extremely comfortable with lots of personal space. It was a great home base from which to explore the island. This is a well laid out home. Master bedroom upstairs everyone else downstairs. :) Fire pit was great. Hot tub off a bedroom also enjoyed. Barbecue on deck. Clean when we arrived. No dampness or mildew in any of the rooms (a problem with other rentals). Few minor items need attention that we outlined on list we left behind. Try the Duck Soup Inn right next to street you turn into - Very good. Eaglestone proved to be everything we hoped it would be: spacious, well-appointed, private, great views. We had three families, with 6 adults and 4 small children. While the home was advertised to not be ideal for small children, we found it was easy to keep the kids away from dangerous slopes and balconies. IT was wonderful, and we would rent this place again in a heartbeat. We arrived to a beautiful home with a spectacular deck and view. Loved the fully stocked kitchen as we chose to cook some amazing meals at home. We loved the island and took the ferry in one day to watch a Mariners game. Every contact made with the property management was professional and pleasant. If there were any recommendations it would be to invest in new mattresses. The house is beautiful and we will stay here again in the future. Beautiful and relaxing with enough space for each person to retreat and have some privacy also. My family enjoyed our stay. it was a great space. we were only five adults and a toddler, but no one got under anyone else's foot. the large comfortable living area accommodated all the busyness hubbub of an active family. My personal favorite was the master bath, and the younger people loved the hot tub. The house is all the pictures show. We had 8 adults and 3 children and it worked fine using the pull out bed in the TV room for the kids. The setting is spectacular and the bald eagle sat outside our window about every other day. Please note: when it says you can not let the kids run around due to the sheer drop off they are right! We had no issues... but it is a good warning if you have little kids that are prone to exploring. Please note that this guest intended to select a 5, not a 1, when reviewing this property condition. We are asking our software provider to make this correction. Thank you, Ed, for this nice review! This house was fantastic - exactly what we were looking for. It has incredible views from the whole first floor, a fabulous big kitchen for cooking that opens to a family room, a pool table, hot tub, chess table, and media room for entertainment. Just enough room for the 9 of us. We loved it. in doing the walk thru in the beginning there several items broken and not sure if reported BEFORE, I did call the management team and let them know on Sunday most of which were reported on the peoples list prior to our stay. None of which made our stay unenjoyable. Only two things that really effect any of our stay was the screen door mesh was detached which meant at night we could not open the door, but it was not extremely hot so it was not an issue. The steamshower which did not work in the bottom bathroom. They did come out to fix it but were unsuccessful during our stay, just to let you know just incase you thought it was fixed. These were the only two items that could have effected someone stay if they were planning on using them. Also I mentioned this to the management team but the downstairs bathroom chair leg was broken. We all new it and did not sit on it, but someone new might so if you didn't already you might want to replace it or remove it from the house, so no one hurts themselves on it. Lucky the leg was off enough we noticed it before anyone tried to sit on it , but your next renters might not be as observant, not that we were normally. Anyway had a great time house was perfect and everyone loved it. The only thing that could have made the experience better was have some kind of access to a beach. THANKS AGAIN AND I WOULD DEFINATELY RECOMMEND IT , IT WAS A LOVELY , PEACEFUL HOUSE. Wow! was our average reaction when the eleven of us stepped inside the house. Built into the edge of a hillside, views of islands, water, sunrise, mountains are spectacular. Now we know how the other 0.1% live! Full amenities, with top of class appliances, 360 glass, with views from everywhere. Priced right (considering that we would have had to rent 5 rooms to get the whole family together anywhere else). Moclips in 2010, followed by this San Juan beauty, leaves us wondering what to do for an encore in 2014. It doesn't get much better. House was absolutely fantastic. Great views. Had everything you could want. Everything went off perfectly. Can't wait to come back. Stephanie H from Seattle, WA does not recommend this vacation rental. This was a top notch rental, and we thoroughly enjoyed it. However, I am not able to recommend this to friends as the check in time of 4pm with an early check out of 10am (and a request to do the dishes!) is unreasonable for the price we are paying. By changing the check in / out to a more standard 3pm / 11am with no required dishes I would recommend it. Hi Stephanie, we are really happy that you enjoyed this beautiful home. We do wish that we could have extended both an earlier and later checkout time to you but unfortunately we cannot do so in our Peak Summer Season. When one guest departs at 10 AM and another arrives at 4 PM on the same day, six hours is barely enough time to complete laundry and properly clean a 5000 square foot home after it's been occupied by 12 guests and a dog. We also appreciate your feelings about doing dishes on vacation, but unlike a hotel with daily maid service, it's commonly expected that guests will wash their cookware after preparing meals in a private home. The only reason we didn't rate this 5 stars was due some cleaning/maintenance issues: a few appliances that did not work well or at all - coffeemaker (I had to descale it to make it work somewhat), trash compactor broken, one washing machine did not work. Also, the dryer had wax in it which stained our clothing and could not be removed. The quality of this home is so high that these things should not happen. More careful cleaning and checking of the house is recommended. Other than this, we totally loved our stay there and are grateful that our golden retriever was welcomed. The home is absolutely gorgeous and what a private location - and we have high standards! Could have had more towels available since there was a hot tub. We were in Roche Harbor for a wedding with many other families. All the families commented Eagle Stone was the best property on the island. We loved the family and kitchen area especially. Views are spectacular on the patio, too. I would highly recommend this property for anyone looking to get away from the hectic pace of life and want an upscale home to host all types of gatherings. Wonderful for a family get together! We had room for our extended family of 11. Lots of family fun playing games and at the pool table. We also really enjoyed the 2 eagles that hung out in the trees just beyond the deck. My only complaint is the dishwasher doesn't work. Hi Marnie, we're happy that you enjoyed the stay but sorry you had dishwasher problems.Will address! This home is beautiful, well appointed and top notch. The accommodations are superb...first class all the way. The property is new, well maintained and immaculate. The location is beatutiful, secluded and peaceful. We loved it! That's what we love to hear and look forward to seeing you again, Teri! and easy. I would stay here again and highly recommend it. The house was incredibly beautiful and fabulous for a group. We are investigating the blocking of the path; however, guests are not advised to approach the shoreline as the trail is merely roughed in and can be precarious. This is a beautiful home with wonderful water views from every room. Windows and skylights flooded the home with natural light. It was very well stocked with kitchen items, extra linens, etc. We appreciated the thoughtful selection of movies, books and games. The location was remote enough to provide seclusion and fabulous views, but still convenient to Roche Harbor and Friday Harbor. We would love to visit again! The home was wonderful! We were the first renter and I would like to return next year for a longer stay in the S an Juans and at this house. Only a few improvements necessary. 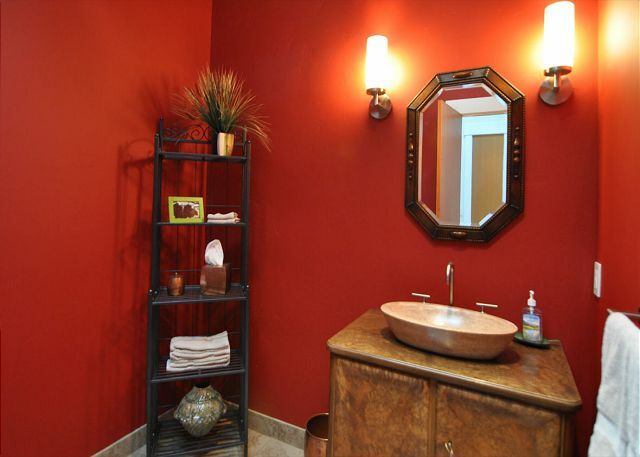 The hot water was inadequate and would not even fill the wonderful tub in the master bath. Need HD flat screens in at least the master bedroom. For a person used to a tempurpedic mattress the master mattress was uncomfortable. The home and it's secluded location and wonderful view made on overlook the minor deficiencies ( except hot water). Thanks for being our first guest! We'll be passing your suggestions to the owners for their attention so that your next stay will be perfect.